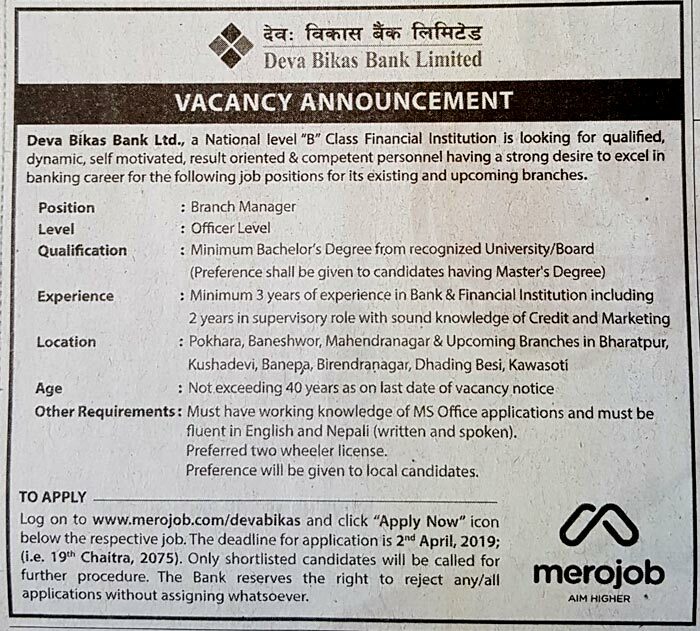 Deva Bikas Bank Ltd., a National level “B” Class Financial Institution is looking for qualified, dynamic & career oriented few Officer Level Staffs for it’s inside and outside Kathmandu Valley Branches. Interested candidates are requested to apply by mentioning your preferred branch within 7 days. The deadline for the vacancy is April 2, 2019. Only shortlisted candidates will be called for further procedure. The Bank reserves the right to reject any/all applications without assigning any reason whatsoever. view original vacancy notice below for application procedure.